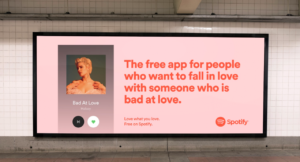 Spotify’s latest consumer marketing campaign, ‘Love What You Love,’ finds the streaming audio company blowing up cars, creating horror movie trailers and helping match people with the right songs in what it states is its biggest marketing campaign to date. 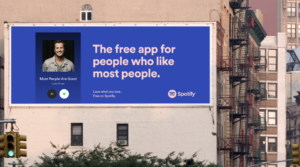 As Spotify doubles down on its commitment to the ‘freemium’ model and to creating a high-quality experience for all of their users, it launches this ambitious, and sometimes quite humorous, multi-faceted campaign. In a release, the company stated that with the new Spotify free experience, ad-supported users have access to all the songs they love and the freedom to discover millions of new songs. In that spirit, the campaign invites people to “love what you love” free on Spotify. “Spotify believes that every person, from casual music listeners to discography aficionados, has a personal connection to their favorite music and that there is a right song for every moment. This campaign celebrates that universal yet personal experience and invites people to embrace their connection to music for free on Spotify,” stated the release. The first part of the campaign features two commercials in which Spotify puts its spin on action and horror film trailers. The second part of the campaign, inspired by dating apps, includes digital videos that the company is calling ‘Match Instantly,’ along with out of home (OOH) marketing, featuring posters and billboards. In time for summer Blockbuster season, Spotify created two faux film trailers for cinema, broadcast, digital TV and social that are rolling out in 11 markets worldwide through to June 21, including the United States, United Kingdom, Spain, Brazil, Mexico, Colombia, Thailand, Indonesia, Australia, Canada and New Zealand. In ‘Chase Love,’ a bad guy and good guy are locked in a car chase, but as the bad guy jumps on good guy’s car and bashes in the windshield, he hears ‘Wrecking Ball’ by Miley Cyrus, and they share a moment before the police show up and also sing along as a car blows up. In ‘Horror Love,’ a homicidal harlequin doll is animated by the sounds of Camilla Cabello’s ‘Havana,’ but unfortunately for those near the doll, its infectious hooks are impossible to resist, and they disappear one by one. 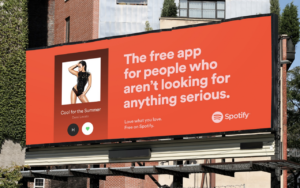 Spotify is also a big fan of out of home marketing, as seen in the company’s recent ‘2018 Goals’ holiday campaign. For ‘Love What You Love,’ the in-house creative team has fashioned a variety of billboards that will be showcased in eight global markets, highlighting personalized and curated playlists, featuring artists such as Demi Lovato, Luke Bryan and Montell Jordan. With its ‘Match Instantly’ videos, Spotify encourages discovery and love for music, celebrating how powerful it can be to find – or rediscover – the perfect song. In a series of romantic vignettes, Spotify elevates everyday music discovery moments into love scenes. There will be three Match Instantly videos in total that will run across digital and social channels in United States, United Kingdom, Spain, Mexico, Colombia, Thailand, Indonesia, Australia, Canada and New Zealand. They include ‘Meadow’ featuring Sza’s song ‘Drew Barrymore’ and ‘Car’ featuring ‘Kiss Me’ by Sixpence None The Richer.